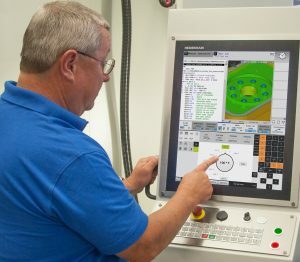 SCHAUMBURG, IL (July 2017) – TNC contouring controls from HEIDENHAIN are popular with users thanks to their workshop-oriented operational design and conversational programming. And now, HEIDENHAIN’s compact TNC 620 control combines its advantages of field-proven HEIDENHAIN contouring controls with the latest in touchscreen technology. The TNC 620 control with touch screen is operated by gestures, similar to smartphones or tablet PCs. The operator can navigate quickly and intuitively through long lists, programs, tables and other content by what is known as kinetic scrolling. A slow, brief swiping movement results in scrolling over a few lines; a longer and quick movement leads to dynamic scrolling over many lines. With a short tap, the user can stop the dynamic scrolling at any time. That makes it possible to easily find, for example, an NC block or a tool in long NC programs or tool tables. In the 3-D test mode, zooming in and out as well as moving and rotating objects is particularly helpful. Further, a pop-up keyboard appears for text input. The new MC 8410 main computer with touch screen technology in the TNC 620 corresponds to the MC 7410 in the prior solution with this functionality. For the machine builder, a newly designed machine control panel MB 721 with or without Functional Safety is also available with the touchscreen, and features three optional elements that can be assigned to additional keys, key switches or a USB connection and provides potentiometers for feed and spindle speed. The previous MC 7410 has also been revised and is now available in a new variant. It can be used with the new MB 721 (FS). This enables the OEM to use the MB 721 (FS) as a standard and choose between the MC 8410 with touch screen or the conventional MC 7410 main computer. Both units have an Intel Celeron Ivy Bridge processor, Dual Core with 1.4GHz and 2 GB RAM memory. 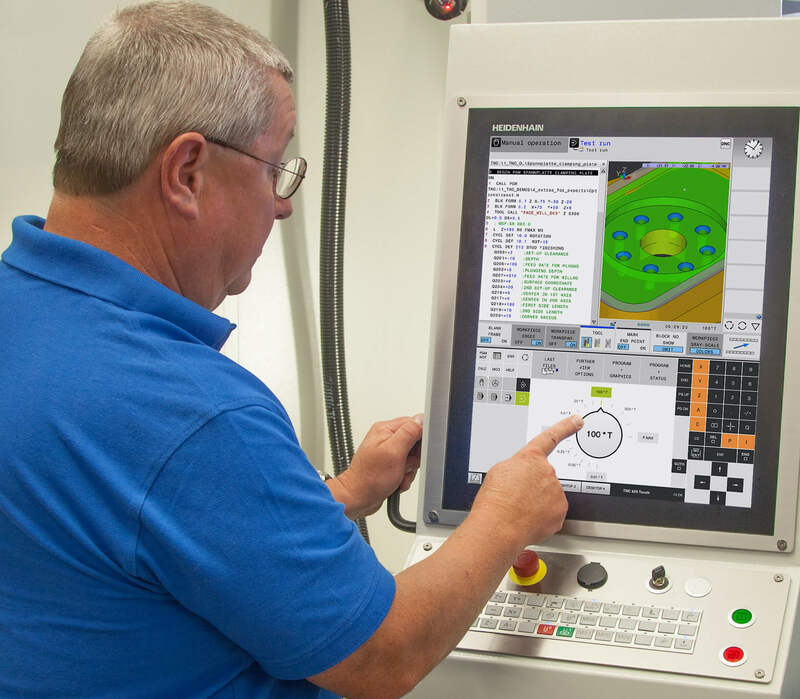 On the software side of the TNC 620, the large range of standard cycles for milling, drilling and boring machines and optional probing functionality remain compatible with older control versions. TNCs remain the leading controls in both prototyping and manufacturing due to its high contour fidelity, high speed and superb surface finish. The TNC 620 comes standardized as 4-axis control, but can optionally be extended to 5-axis simultaneously operation. HEIDENHAIN CORPORATION is the North American subsidiary of DR. JOHANNES HEIDENHAIN GmbH, a leading international manufacturer of precision measurement and control equipment. Our product line includes linear scales, rotary and angular encoders, digital readouts, digital length gauges, CNC controls and machine inspection equipment. For more information, contact HEIDENHAIN’s Product Specialist for Machine Tools Julian Renz at 847-884-4761 or write to us at HEIDENHAIN CORPORATION, 333 E. State Parkway, Schaumburg, IL 60173.